This is a place for people to make their opinion, that they don't support gay marriage, known. THIS IS MY WIKI AGAINST GAY MARRIAGE. IF YOU ALSO THINK THAT THE STRAIGHT WAY IS THE WAY TO GO, TALK TO ME [dfafadsfasdasf] OR [OrangeFire16]. Please to all supporters of gay marriage: don't think that the purpose of this wiki is to discriminate, we just want to state our opinions and it is our right to do so. We can still get along even though we have different political stances, ok? The mistreatment of gays or bisexuals will be on a zero tolerance. I do not support being cruel to any human being unless given a reason. However I'm not telling you to not defend yourself if you are being harassed by a gay or bi: then I have no problem with you defending yourself. Thank you and spread the word: the more members the better! 2007-03-02 [Zab]: I think that it's less common to divorce in the US, because people there generally seem more christian, and have the mentality that a true christian never divorce no matter what. At least here not too many people are very seriously christians, they believe in a little different way. 2007-03-02 [Fizban]: Lols. The only reason marriage worked in the first place is because people would force themselves to stay with the person for social's sake. Also, I have a very large theory about alot of thinks. Like I don't think people are actually supposed to live as long as we do. Going on that thesis, in the days of marriage, when people living to be 40 was wonderful in those days, staying with someone for your entire life wasn't as hard. When people don't live that much longer after they get married, it's easy to stay married. We live longer, the social institution is much harder. Honestly, thats my theory lol. 2007-03-02 [I'm her Georgia *Peach! *]: actually... look at the stats. XD zab, the US divorce is like 8 times the UK. I think marriage is nifty. One person doesn't have to carry the burden of supporting a child (by the way, being a housewife/dad is equivalent to multiple full-time jobs. @. @ I forget the numbers, but that's what a psychiatrist said.) So, it's nifty. And beyond raising children... I guess it's not important. It has nifty medical and tax benefits, so that total strangers can't go in and see you before your cousin (XD!) ...and stuff. 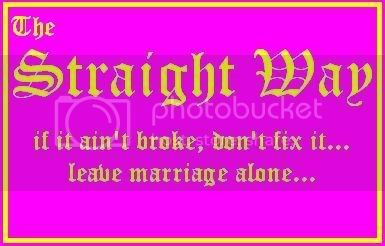 I think that the stricter and more "MARRIAGE!" you try to be, the more unhappy couples will exist and the more divorces there'll be. It's so stressful to be that way; I think that's why. So much tension just builds up and builds up and then breaks stuff. And divorces/domestic violence is people breaking. Now, not always. But some cases. Sometimes, people were just idiots or began to get a drinking problem for work or whatever, but sometimes it's the strictness of society. 2007-03-03 [Fizban]: Umm, Medieval Europe was not comprised of wholly idiotic people. The restriction of schooling was a major problem yes. However, I disagree. There just weren't many choices to be made, good or bad, intelligent or stupid, to change things. 2007-03-03 [Fizban]: LOL...well first of all, weddings don't necessarily need priests. Second of all, the atheists would want the benefits economically of marriage I assume, or else marriage wouldn't be a consideration. 2007-03-03 [MagpieWisdom]: Thank you for all being so friendly in responce to be comment, I'm going to stop watching this page now, so bye. I think it just shows that people can still be nice to each other even if their views differ as much as ours, it justs takes a little understanding. Again, thank you all. Much Love, Oliver. 2008-03-06 [*Phoenix*]: can I be a member?? plz! 2008-03-06 [levhole]: Yeah I think you just have to find the members page and add yourself, although they may have protected it. 2008-07-07 [Fizban]: -_- LOL. Yes, there are immature gay people. Just like there are immature straight people. It's not about being straight or gay, its about being people. Everyone can be immature. One could easily retort what you just said with a "Well those immature straight people act like they know what freedom of speech is, when us gay people haven't had freedom of speech for centuries because of them." However instead, I would simply like to point out that labeling is what is causing a lot of these problems, so tolerance and understanding should be the goal, for everyone. 2009-02-16 [Diiwica]: I would like to be a member please.